Holden has declared its support for Supercars’ new ECB SuperUtes Series, which is set to feature the Colorado when it launches in 2018. The Australian arm of General Motors supplied a dual-cab diesel Colorado to Supercars earlier this year for the model’s homologation. It will be one of six models represented in the new class alongside the Ford Ranger, Mitsubishi Triton, Mazda BT-50, Toyota Hilux and Isuzu D-Max. Holden is also known to be talking with several prospective teams about racing Colorados in 2018, with a maximum of six of entries permitted from each brand. In announcing its endorsement of the category, Holden has released an official render of what a Colorado SuperUte may look like. GM Holden General Manager – Brand, Media and Sponsorship, Emma Pinwill says she’s looking forward to seeing the Colorado carry on the marque’s winning heritage. 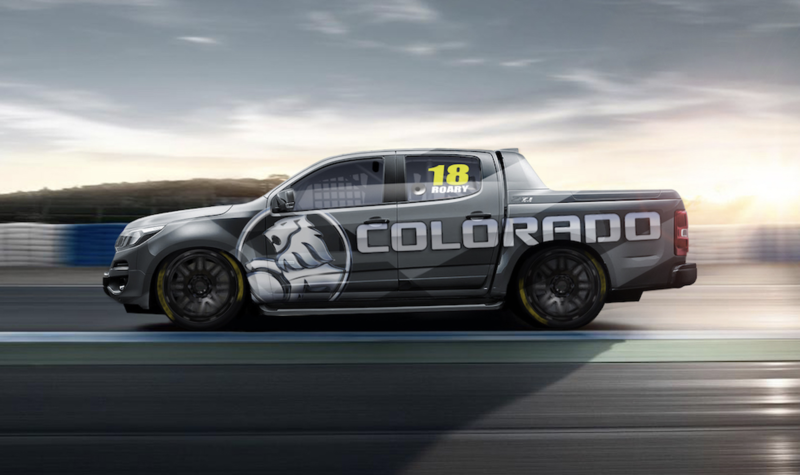 “SuperUtes is an exciting new racing series and supporting Australian motorsport has been an important part of Holden’s heritage, so we are delighted to homologate Colorado for the series,” she said. “Colorado has been engineered to handle anything thrown at it by our customers, from inner city and suburban roads to rural highways, dirt roads, and off-road. Supercars has set 340bhp, 500lb/ft and 1,800kg targets for the series, although the minimum weight of some vehicles is expected to be lowered if they cannot meet the performance markers. All SuperUtes will carry a selection of control components to ensure parity and minimise costs. Following a private shakedown at Norwell on the Gold Coast last week, the Triton will run a series of laps for television filming purposes. Supercars CEO James Warburton says having Holden onboard for the new series is a major plus. “Holden has been such an integral part of Supercars rich history, so it goes without saying that we are delighted to welcome it to the SuperUtes ECB Series,” he said. “The Holden Colorado is now officially homologated and will take on five different manufacturers in what is shaping up to be an outstanding series.